Inflow’s technical SEO specialist Rick Ramos performed an earlier version of our content audit last year for Phases Design Studio, who graciously permitted us to share their case study. After taking an inventory of all content URLs on the domain, Rick outlined a plan to noindex/follow and remove from their sitemap many of the older blog posts that were no longer relevant, and weren’t candidates for a content refresh. The site also had a series of campaign-based landing pages dating back from 2006. These pages typically had a life cycle of a few months, but were never removed from the site or Google’s index. Rick recommended that these pages be 301 redirected to a few evergreen landing pages that would be updated whenever a new campaign was launched—a tactic that works particularly well on seasonal pages for eCommerce sites (e.g. 2014 New Years Resolution Deals). Still more pages were candidates to be updated / refreshed, or improved in other ways. 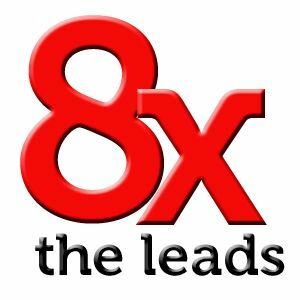 Shortly after the recommendations were implemented the client called to ask if we knew why they were suddenly seeing eight times the amount of leads they were used to seeing month over month. The ratio of useful, relevant, unique content to thin, irrelevant, duplicate content was greatly improved. The PageRank from dozens of expired campaign landing pages was consolidated into a relatively few evergreen pages (via 301 redirects and consolidation of internal linking signals). Crawl budget is now being used more efficiently. This improved the overall customer experience on the site, as well as organic search rankings for important topic areas that were consolidated. Since then we have refined and improved the process and have been performing them on a variety of sites with great success. It works particularly well for panda recoveries on large-scale content websites, and for prioritizing which eCommerce product copy needs to be rewritten first. 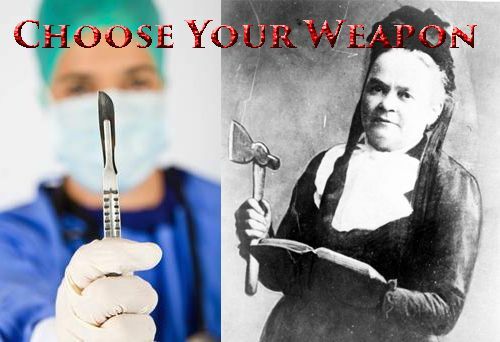 Choose to keep as-is, improve, remove or consolidate. Write detail strategies for each. Use keywords that did not have an appropriate page match to fill in the Content Gap tab. Each piece of the process can be customized for the needs of a particular website. For example, when auditing a very large content site with lots of duplicate/thin/overlapping content issues we may skip the entire keyword research and content gap analysis part of the process and focus on pruning the site of these types of pages and improving the rest. Alternatively, a site without much content may need to focus on keyword research and content gaps. Other sites may be looking specifically for content assets that they can improve, repeat in new ways or leverage for newer content. One example of a very specific goal would be to identify interlinking opportunities from strong, older pages to promising, newer pages. For now it is sufficient to know that the framework can be changed as needed in a way that could dramatically affect where you spend your time in the process, or even which steps you may want to skip altogether. There are several major steps in the content auditing process that require various documents. While I’m not providing links to our internal SOP documentation (mainly because it’s still evolving), I will describe each document and provide screenshots and links to examples / templates so you can have a foundation around which to customize one for your own needs. 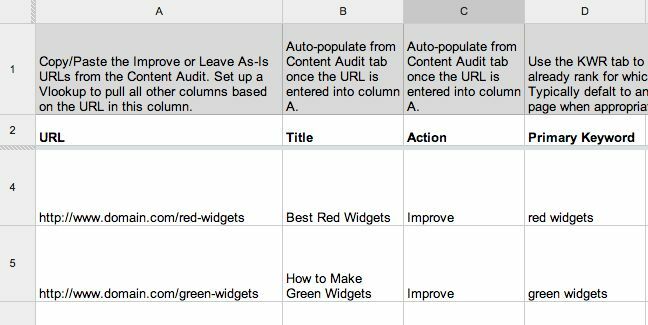 We keep a list of recommendations for common scenarios to guide our approach to content audits. While every situation is unique in its own ways, we find this helps us get 90% of the way to the appropriate strategy for each client much faster. I discuss this in more detail later, but if you’d like to take a peek click here. This tab within the dashboard is where most of the work is done. 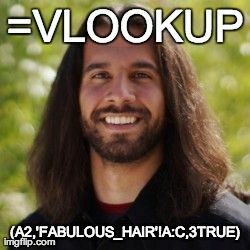 Other tabs pull data from this one by VLookup. Whether the data is fetched by API and compiled by one tool (e.g. URL Profiler) or exported manually from many tools and compiled manually (by VLookup), the end result should be that you have all of the metrics needed for each URL in one place so you can begin sorting by various metrics to discern patterns, spot opportunities and make educated decisions on how to handle each piece of content, and the content strategy of the site as a whole. A more detailed version of “action”. Example: Remove and 301 redirect to /another-page/. Our recommendations typically fall into one of four “Action” categories: “Keep As-Is”, “Remove”, “Improve”, or “Consolidate”. Further details (e.g. remove and 404, or remove and 301? If 301, to where?) are provided in a column called “Strategy”. Some URLs (the important ones) will have highly customized strategies, while others may have been bulk processed, meaning thousands could share the same strategy (e.g. rewriting duplicate product description copy). The “Action” column is limited in choices so we can sort the data effectively (e.g. see all pages marked as “removed”) while the “Strategy” column can be more free-form and customized to the URL (e.g. consolidate /buy-blue-widgets/ content into /buying-blue-widgets/ and 301 redirect the former to the latter to avoid duplicating the same topic). This tab includes keywords gathered from a variety of sources, including brainstorming for seed keywords, mining Google Webmaster Tools, PPC campaigns, the AdWords Keyword Planner and several other tools. 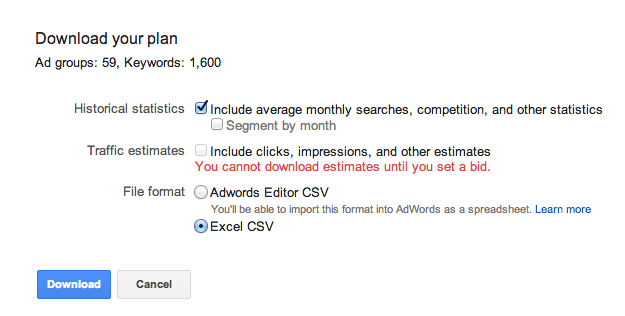 Search Volume and Ad Competition (not shown in this screenshot) are pulled from Google’s Keyword Planner. The average ranking position comes from GWT, as does the top ranking page. The relevancy score is something we typically ask the client to do once we’ve cleaned out most of the obvious junk keywords. This tab includes URLs for important pages, and those that are ranking for – or are most qualified to rank for – important topics. It essentially matches up keywords with the best possible page to guide our copywriting and on-page optimization efforts. Sometimes the KWM tab plays an important role in the process, like when the site is relatively new or unoptimized. Most of the time it takes a back-seat to other tabs in terms of strategic importance. This is where we put content ideas for high-volume, highly relevant keywords for which we could not find an appropriate page. Often it involves keywords that represent stages in the buying cycle or awareness ladder that have been overlooked by the company. Sometimes it plays an important role, such as with new and/or small sites. Most of the time this also takes a back-seat to more important issues, like pruning. If it was marked for “Remove” or “Consolodate” it should be on this tab. Whether it is supposed to be removed and 301 redirected, canonicalized elsewhere, consolidated into another page, allowed to stay up but with a robots “noindex” meta tag, removed and allowed to 404/410… or any number of “strategies” you might come up with, these are the pages that will no longer exist once your recommendations have been implemented. I find this to be a very useful tab. For example, one could export this tab, send it to a developer (or a company like WP Curve), and have someone get started on most or all of the implementation. Our mantra for low-quality, under-performing content on sites that may have a Panda-related traffic drop is to improve it or remove it. The more data that can be compiled by a tool like URL Profiler, the fewer data tabs you’ll need and the faster this entire process will go. 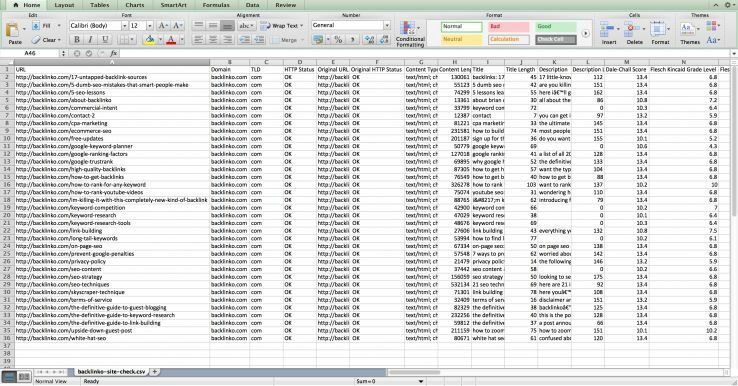 Before we built the internal tool to automate parts of the process, we also had tabs for GA data, Moz data, and the initial Screaming Frog export. 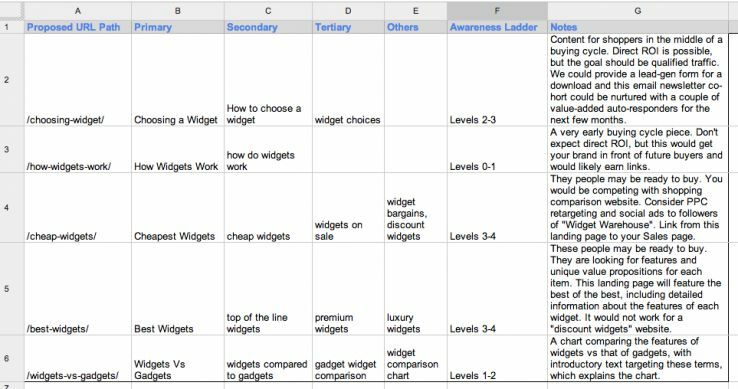 The Content Audit Dashboard is just what we need internally: A spreadsheet crammed with data that can be sliced and diced in so many useful ways that we can always go back to it for more insight and ideas. Some clients appreciate it as well, but most are going to find the greater benefit in our final content strategy, which includes a high-level overview of our recommendations from the audit. There are many options for getting the data you need into one place so you can simultaneously see a broad view of the entire content situation, as well as detailed metrics for each URL. For URL gathering we use Screaming Frog and Google Analytics. For data we use Google Webmaster Tools(GWT), Google Analytics (GA), Social Count (SC), Copyscape (CS), Moz, CMS exports, and a few other data sources as needed. However we’ve been experimenting with using URL Profiler instead of our internal tool to pull all of these data-sources together much faster. URL Profiler is a few hundred bucks and is very powerful. It’s also somewhat of a pain to set up the first time, so be prepared for several hours of wrangling down API keys before getting all of the data you need. No matter how you end up pulling it all together in the end, doing it yourself in Excel is always an option for the first few times. Below is the step-by-step process for an “average” client – whatever that means. Let’s say it is a medium-sized eCommerce client with about 800-900 pages indexed by Google, including category, product, blog posts and other pages. They don’t have an existing penalty that we know of, but could certainly be at risk of being affected by Panda due to some thin, overlapping, duplicate, outdated and irrelevant content on the site. Every situation is different, but we have found common similarities based on two primary factors – The size of the site and its content-based penalty risk. 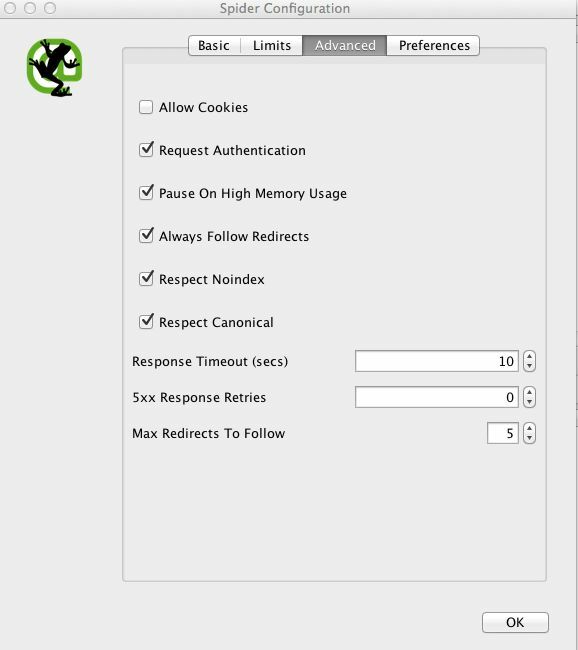 Below is a screenshot from our list of recommended strategies for common content auditing scenarios, which can be found here on GoInflow.com. Each of the colored boxes drops down to reveal the strategy for that scenario in more detail. Hat tip to Ian Lurie’s Marketing Stack for design inspiration. The site is in danger of a penalty (though it does not appear to have one “yet”) so we follow the Panda matra: Improve it or Remove it. The size of the site determines which of those two (improve or remove) gets the most attention. Smaller sites need less pruning (scalpel), while larger sites need much more (hatchet). Smaller sites often need some keyword research to determine if they are covering all of the topic areas for various stages in the customer’s buying cycle, while larger sites typically have the opposite problem —> too many pages covering overlapping topic areas with low-quality (thin, duplicate, irrelevant, outdated, poorly written, automated…) content. Such a site would not require the keyword research, and would therefore not be getting a keyword matrix or content gap analysis, as the focus would be primarily about pruning the site. Our focus in this example will be to audit the content with an eye to improve and/or Remove low performing pages, followed by keyword research and a keyword matrix for the primary pages, including the home page, categories, blog home and key product pages, as well as certain other topical landing pages. As it turns out, this hypothetical website has lots of manufacturer-supplied product descriptions. We’re going to need to prioritize which ones get rewritten first because the client does not have the cash-flow to do them all at once. When budget and time is a concern, we typically shoot for the 80/20 rule: Write great content for the top 20% of pages right away, and do the other 80% over the course of 6-12 months as time/budget permit. Because this site doesn’t have an existing penalty, we will recommend that all pages stay indexed. If they had a penalty already, we would recommend they noindex,follow the bottom 80% of pages, gradually releasing them back into the index as they are rewritten. This may not be the way you choose to handle the same situation, which is fine, but the point is you can easily sort the pages by any number of metrics to determine a relative “priority”. The bigger the site and tighter the budget, the more important it is to prioritize what gets worked on first. OK in small amounts, but often entire blogs are full of it. A typical example would be a “linkbait” piece circa 2010. Comprised almost entirely of bits and pieces of content that exists elsewhere. Notice that “crawl all subdomains” is checked. This is optional, depending on what you’re auditing. We are respecting “meta robots noindex”, “rel = canonical” and robots.txt. Also notice that we arenot crawling images, CSS, JS, flash, external links…. This type of stuff is what we look at in a Technical SEO Audit, but would needlessly complicate a “Content” Audit. What we’re looking for here are all of the indexable HTML pages that might lead a visitor to the site from the SERPs, though it may certainly lead to the discovery of technical issues. 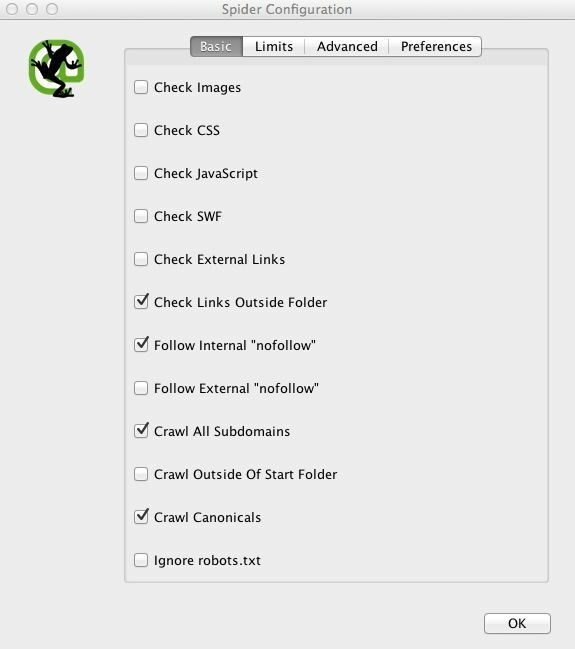 Export the complete list of URLs and related data from Screaming Frog into a CSV file. The output changes depending on which boxes you check and what API access you have. As described in the 50,000 foot overview above, we have a spreadsheet template with multiple tabs, one of which is the “Content Audit” tab. The tool output gets brought into the Content Audit tab of the dashboard. Our internal tool automatically ads columns for Action, Strategy, Page Type and Source (of the URL). You can also add these to the tab after importing the URL Profiler output. Page Type and URL Source are optional, but Action and Strategy are key elements of the process. Our hypothetical client requires a Keyword Matrix. However, if your “scenario” does not involve keyword research (i.e. if it is a big site with content penalty risks) you can skip steps 5-7 and move straight to “Step 8 – Time to Analyze and Make Some Decisions”. There may be a way to do this with URL Profiler. If so, I haven’t found it yet. Here is what we do to grab the landing page and associated keyword/query data from Google Webmaster Tools, which we then import into two tabs (GWT Top Queries and GWT Top Pages). These tabs are helpful when filling out the Keyword Matrix because they tell you which pages Google is already associating with each ranking keyword. This step can actually be skipped altogether for huge sites with major content problems because the “Focus” is going to be on pruning the site of low quality content, rather than doing any keyword research or content gap analysis. See bottom of GWT page (e.g. 1-500 of ####). Copy and Paste the following script into the console window and press Enter. This action should expand all of the drop-downs to show the keywords under each “page” URL and then open up a dialog window that will ask you to save a CSV file: (more info here andhere). Ignore any dialog windows that pop up. 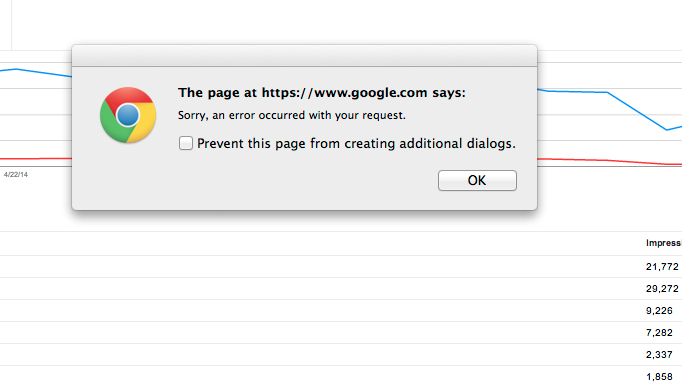 You can check “Prevent this page from creating additional dialogs” to disable them. Import the resulting download.csv file from GWT into the “GWT Top Pages” tab in the Content Auditing Dashboard. Within GWT switch back to Top Queries. Adjust the date to go back as far as you can. Import the resulting TopSearchQueries.csv file from GWT into the “GWT Top Queries” tab in the Content Auditing Dashboard. This is another optional step, depending on the focus/objective of the audit. It is also highly customizable to your own KWR process. Use whatever methods you like for gathering the list of keywords (e.g. brainstorming, SEMRush, Google Trends, Uber Suggest, GWT, GA…). Ensure all “junk” and irrelevant keywords are removed from the list, and run the rest through a single tool that collects search volume and competition metrics. We use the Google Adwords Keyword Planner, which is outlined below. Go to www.google.com/sktool/ while logged into our Google email account associated AdWords. Select “Get search volume for a list of keywords or group them into ad groups”, paste in your list of keywords and click “Get search volume”. Note: At this point you should have already expanded the list as much as you need/want to so you’re just gathering data and organizing them now. Note: The copy/paste method is limited to 1,000 keywords. You can get up to 3,000 by uploading your simple .txt file. Go to the “Keyword Ideas” tab on the next screen and Add All keywords to the plan. Go to the “Ad Group Ideas” tab and choose to Add All of the ad groups to the plan. Download the plan, as seen in the screenshot below. Again, you don’t need to do this step if you’re working on a large site and the focus is on pruning out low quality content. The GWT Queries and KWR steps provide data needed to develop a “Keyword Matrix” (KWM), which isn’t necessary unless part of your focus is on-page optimization and copywriting of key pages. Sometimes you just need to get a client out of a penalty, or remove the danger of one. The KWM comes in handy for the important pages marked as “Improve” within the Content Audit tab just so the person writing the copy understands which keywords are important for that page. It’s SEO 101 and you can do it anyway you like using whatever tools you like. Step 8: Time to analyze and make some decisions! All of the data is right in front of you, and your path has been laid out using the Content Audit Scenarios tool. From here on the actual step-by-step process becomes much more open to interpretation and your own experience / intuition. Therefore, do not consider this a linear set of instructions meant to be carried out one after another. You may do some of them and not others. You may do them a little differently. That is all fine as long as you are working toward the goal of determining what to do, if anything, for each piece of content on the website. Which of these pages should be rewritten? Which of these pages should be removed / pruned? “Prune from site to remove duplicate content. This URL has no links or shares and very little traffic. We recommend allowing the URL to return 404 or 410 response code. 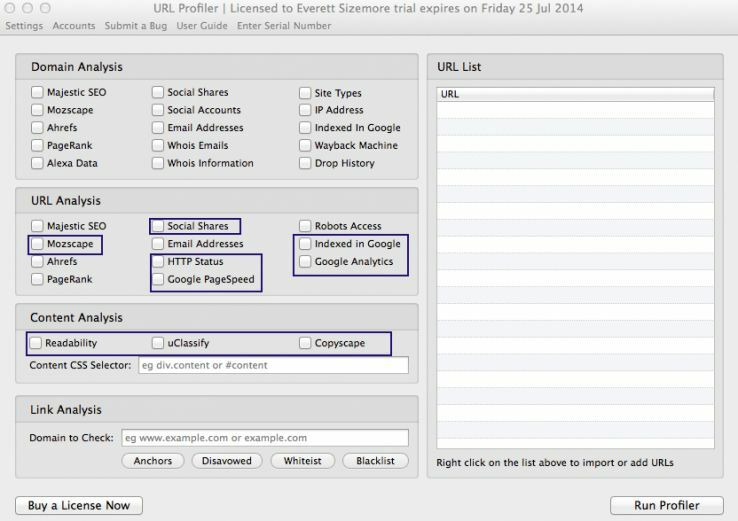 Remove all internal links, including from the sitemap. Which of these pages should be consolidated into others? In the Strategy column provide a link to the CopyScape report and instructions for filing a DMCA / Copyright complaint with Google. Which of these pages should be marked as “Improve”? Which of these pages should be marked as “Consolidate”? When you have overlapping topics that don’t provide much unique value of their own, but could make a great resource when combined. Mark the page in the set with the best metrics as “Improve” and in the Strategy column outline which pages are going to be consolidated into it. This is the canonical page. Use portions of this content to round out /canonicalpage/ and then 301 redirect this page into /canonicalpage/ Update all internal links. Campaign-based or seasonal pages that could be consolidated into a single “Evergreen” landing page (e.g. Best Sellers of 2012 and Best Sellers of 2013 —> Best Sellers). Which of these pages should be marked as “Remove”? Typically these will be allowed to 404/410. The strategy will depend on link equity and traffic as to whether it gets redirected or simply removed. Which of these pages should be marked as “Leave As-Is”? Pages with good traffic, conversions, time on site, etc… that also have good content. For big sites It is best to use a hatchet-approach as much as possible, and finish up with a scalpel in the end. Otherwise you’ll spend way too much time on the project, which eats into the ROI. This is not a process that can be documented step-by-step. For the purpose of illustration, however, here are a few different examples of hatchet approaches and when to consider using them. Strategy = Apply a noindex meta tag. Once they are removed from the index, disallow /search/ in the robots.txt file. Strategy = Write 2-3 sentences of unique, useful content that explains choices, next steps or benefits to the visitor looking to choose a product from the category. In cases where the URL indicates the publishing date…. Although most of these could be put as optional items during the keyword research process, I prefer to save them until last because I never knows how much time I’ll have after taking care of more pressing issues. If you’ve gone through the trouble of identifying keywords and the pages already ranking for them, it isn’t much of a step further to figure out which keywords could lead to ideas about how to fill content gaps. At Inflow we like to use the “Awareness Ladder” developed by Ben Hunt, as featured in his bookConvert!. You can learn more about it here. If time permits, or the situation dictates, we may also add a column to the Keyword Matrix or Content Audit which identifies which level of content the page would need to compete in its keyword space. We typically choose from Basic, Standard and Premium. This goes a long way in helping the client allocate copywriting resources to work where they’re needed the most (i.e. best writers do the Premium content). If time permits, or the situation dictates, we may provide topic bucketing for landing pages and/or keywords. More than once this has resulted in recommendations for adding to or changing existing taxonomy with great results. The most frequent example is in the “How To” or “Resources” space for any given niche. This is a good place to enlist the help of a client, especially in complicated niches with a lot of jargon. Sometimes the client can be working on this while the strategist is doing the content audit. The Content Strategy, or whatever you decide to call it, should be delivered at the same time as the audit, and summarizes the findings, recommendations and next steps from the audit. It should start with an Executive Summary and then drill deeper into each section outlined therein. 605 Product Pages are to be rewritten due to use of manufacturer product descriptions (duplicate content), these being prioritized from first to last within the Content Audit. 63 “Other” pages to be rewritten due to low-quality or duplicate content. Keeping 26 pages as-is with no rewriting or improvements needed unless the page exists in the Keyword Matrix, in which case it requires on-page optimization best practices be reviewed/applied. On-Page optimization focus for 25 pages with keywords outlined in the Keyword Matrix tab. These changes reflect an immediate need to “improve or remove” content in order to avoid an obvious content-based penalty from Google (e.g. Panda) due to thin, low-quality and duplicate content, especially concerning Representative and Dealers pages with some added risk from Style pages. Begin a copywriting project to improve/rewrite content on Style pages to ensure unique, robust content and proper keyword targeting. 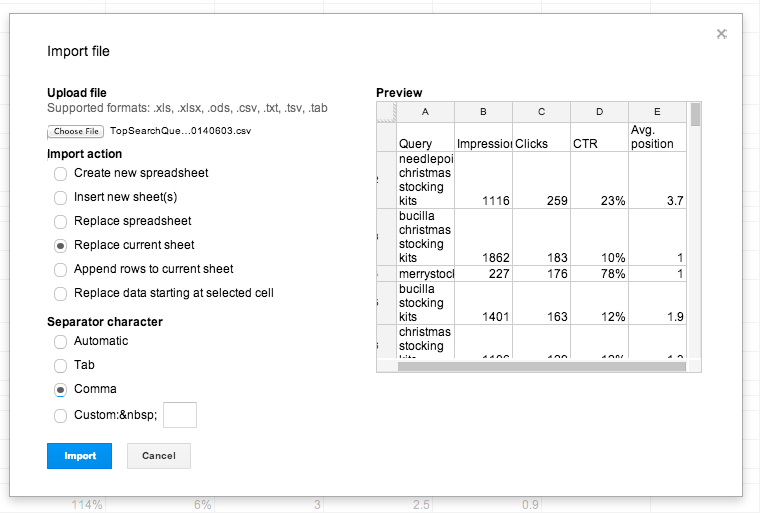 Improve/rewrite all pages in the Keyword Matrix to match assigned keywords. See the “Strategy” column for more complete instructions for each page. Improve/rewrite all remaining pages from the “Content Audit” tab listed as “Improve”. Make a copy of this Google Docs spreadsheet, which is a basic version of how we format ours at Inflow. This page/tool will help you determine where to start and what to focus on for the majority of situations you’ll encounter while doing comprehensive content audits. This one focuses mostly on categorizing pages by buying cycle stage. Dan wrote an epic post recently about content strategies for eCommerce businesses, which includes several good examples of content on different types of pages targeted toward various stages in the buying cycle. See the section on Content Inventory and Audit. Praise for the life-changing powers of a good content audit inventory. Temple did a good job of spelling out the “how to” in terms of a high-level overview of his process to inventory content, assess its performance and make decisions on what to do next. While not a step-by-step “How To” like this post, Ahava’s call for marketing analysts to approach these proejcts from both a quantitative (content inventory) and qualitative (content quality audit) resonated with me the first time I read it, and is partly responsible for how I’ve approached the process outlined above.